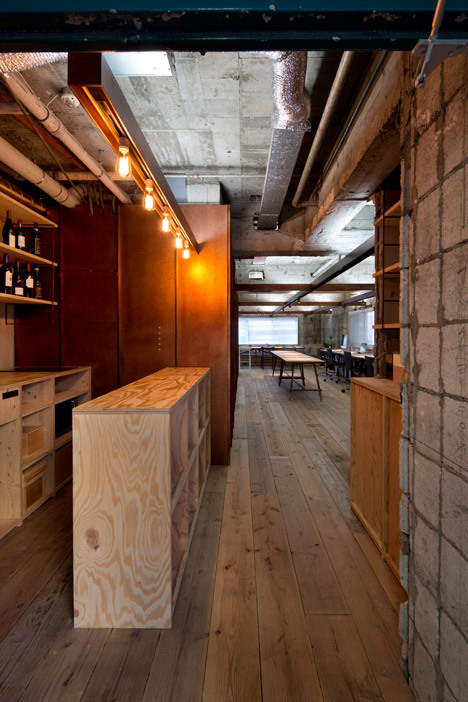 Tokyo architecture studio Suppose Design Office has repurposed old scaffold boards to create flooring and furniture for the concrete interior of its own atelier space (+ slideshow). 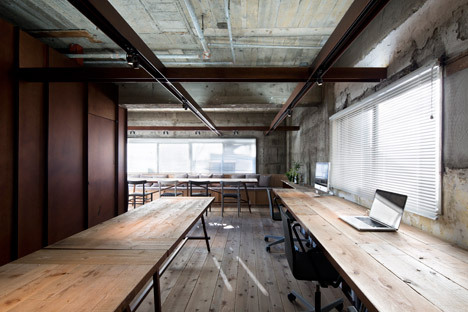 To create their workspace in the Japanese capital's Shibuya ward, Suppose Design Office's architects chose a palette of materials they sourced themselves. "When we had thought to create our new office, to chose usual materials in catalogues seemed different from our philosophy to create a space," said the studio. "Materials in a catalogue are already designed by someone, and to chose them means borrowing the design from them." "If we create a new idea of a space by rethinking its materials, a new space design may naturally take form," the architects added. 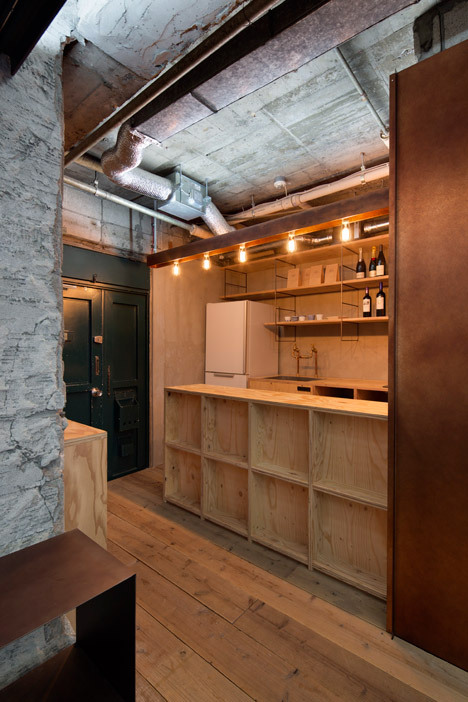 Keen to carry out the work in-house, they stripped back the existing fittings in the 65-square-metre space to expose the concrete ceiling and walls. "We dismantled the space by ourselves, and designed how it should have been dismantled," said the studio. "To dismantle a space is part of the way to recreate it, and it enable us to feel the past when the space was created." Galvanised steel beams treated with a paint finish were installed as a grid across the ceiling, providing a structure to contain uplighting along the top and spotlights beneath. Matching sheets of the steel clad a washroom and a storage area on one side of the office. 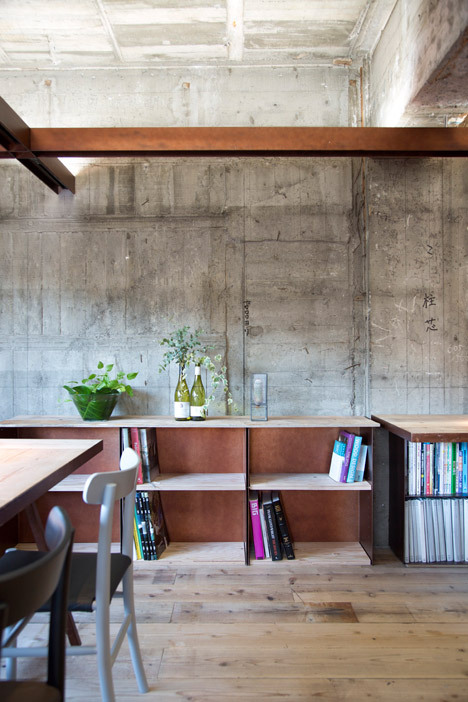 A bookshelf was integrated into the end of the structure, with plywood shelves slotted between the vertical metal fins to form a square grid. Lower storage units on the other side of the room were built in the same way. Reclaimed scaffold planks were laid across the floor throughout the space and used to create surfaces for long tables positioned along the walls. At the end, a fixed bench beneath a large window provides seating for a more informal meeting table. A larch plywood counter located at the entrance to the space acts as a reception desk for greeting guests. 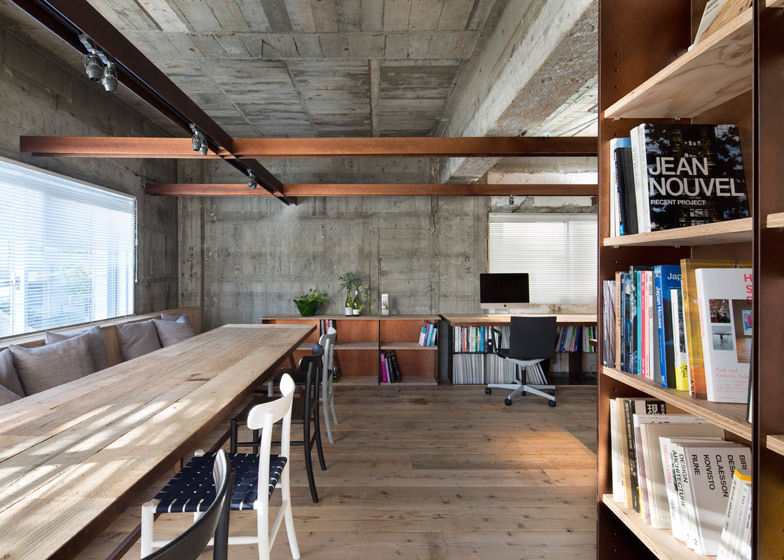 It is also used as a cafe area for making coffee and a bar for mixing drinks when necessary. "The office has not only the function of an architecture studio but also various kinds of shop occasionally," said the designers, who have also recently completed a car showroom with a simple wooden facade and a house that slopes down beyond the boundary wall of a reservoir. "The office will be open to the society, which means not only our customers, builders, engineers, salespeople and people related to architecture but also all the people who live around us, by designing the entrance space as a shop," the architects added.